Are you looking for the best Black Friday and Cyber Monday web hosting deals for 2019? You’re in the right place and this is the only place where you will be finding a ton of best web hosting black Friday and cyber Monday deals for bloggers in 2019 and will end up getting from 50% to 98% OFF on blogging products (web hosting, SEO Tools, Themes, Plugins etc). Let’s get started to find the best black Friday and Cyber Monday web hosting deals without much ado. How do Black Friday and Cyber Monday web hosting deals for 2019 work? SEMrush black Friday and cyber Monday hosting deals: $119 Valued Goodie! As you can see, you can grab up to 98% on most of the black Friday & cyber Monday web hosting deals just by clicking those links. But some of you might have a major question. How do these black Friday and Cyber Monday hosting deals work? So let me clarify it by giving you a live example. For example, if you want to grab Hostgator (which offers up to 70% off on its hosting plans during black Friday and cyber Monday web hosting deals), here it how it works. All day access: From 1:00 am to 11:59 pm CST. Coupon code: 2019BF (to get all day access but you’ll get up to 65% discount with $5.99 select domains. All day access: From 1:00 am to 11:59 pm CST. Coupon code: 2019SB (to get all day access but you’ll get up to 65% discount with $5.99 select domains. All day access: From 1:00 am to 11:59 pm CST. Coupon code: 2019CM (to get all day access but you’ll get up to 65% discount with $5.99 select domains. That’s how the black Friday and cyber Monday web hosting deals pattern work for all the remaining hosting deals as well which are mentioned in the above table on the same page. SO what are you waiting for? GO grab them before those deals end. During this black Friday and cyber Monday, Bluehost is offering a whooping discount of 60% on their shared hosting plans. SiteGround is probably the best hosting choice for bloggers who are looking for affordable hosting choices and faster speeds because it offers you SSD storage. During this Black Friday and Cyber Monday week, SiteGround is offering you 75% HUGE discount. Quick note: The deal will run from 23rd to 26th November, 2019 (only for 4 days). SiteGround gives you the following benefits. So what are you waiting for? Go grab the 75% discount on SiteGround now. Hostinger is one of the widely preferred hosting choices for most bloggers who are in search for affordable hosting plans. During this black Friday and cyber Monday week, they are offering massive deals and discounts where you can save up to 90% on their hosting plans. Here are few amazing benefits of using their hosting plans. Looking for the latest black Friday and cyber Monday hosting deals around Namecheap? Namecheap is one of the widely known name registrars in the world with millions of customers and it also offers SSL and web hosting solutions. During this black Friday week, they are offering insane deals. This is one of the best deals of Namecheap because you get upto 98% discount on Namecheap purchases including domains, SSL and hosting. Do you want to host your site on cloud hosting environment? Are you looking for the best cloud hosting deals to save more during this black Friday and cyber Monday week? Then, you should definitely try Cloudways which is one of the top notch cloud based hosting platforms which gives you access to over 150 excellent features. During this black Friday week, Cloudways offering astonishing deals and discounts. Cloudways is offering 30% discount for the first 3 months on ALL of their hosting plans. Yes, you heard it right. Yes, you need to enter the coupon code BFCM18 to get 30% off for 3 months. The deal from Cloudways is already live and it’s valid till 30th Nov, 2019. So go grab the deal using the following link. WPEngine is most popular hosting choice for most bloggers and professionals around the world who want faster loading websites. 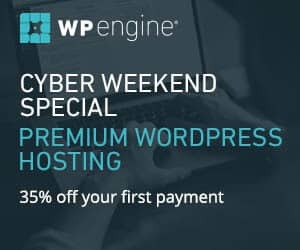 During this black Friday and cyber Monday week, WPEngine is offering HUGE deals and discounts where you can save up to 35% on their hosting plans and also get 5 1/2 month free hosting. Here are the details of WP Engine black Friday deal for 2019. SEMrush is one of the widely used premium SEO plugins which is used by over 3 million people across the world. During this black Friday and cyber Monday week, SEMrush is offering an awesome $119 valued goodie of 1 month free access to Traffic Think Tank (which is a #1 SEO slack community where you get expert advice on increasing your search traffic). Here are the details of SEMrush black Friday deal for 2019. So there you go. That’s the list of all the web hosting choices along with the best black Friday and cyber Monday deals and discounts. Pick the right one that suits your needs and make sure to grab the deal before the sale ends. Do you have any questions about the best black Friday and Cyber Monday web hosting deals, please leave in the comments section. This is an amazing list of a lot of nice offers! The one that I would personally recommend is WPX Hosting. That is the one I use for my blogs and they have been providing me with great service and customer support. Thank you for sharing this helpful list Anil!